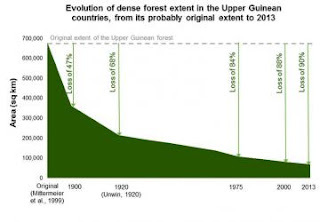 Only remnants of Ghana's once verdant forest cover survive. (Cercocebus lunulatus) is a critically endangered monkey whose numbers have declined by 50% in the span of three decades. Habitat loss and poaching are the primary causes of their decline. White-naped mangabeys have distinctive dark markings on their faces that resemble sideburns. 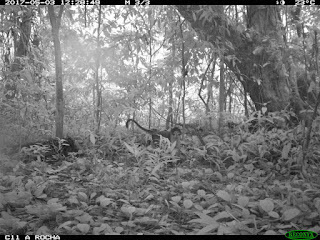 The photos were taken in May 2017 as part of a survey of the region, but the monkeys' presence in eastern Ghana was not realized until December. They are known to inhabit a small number of forests in western Ghana, but none were thought to still live in the eastern part of the country. 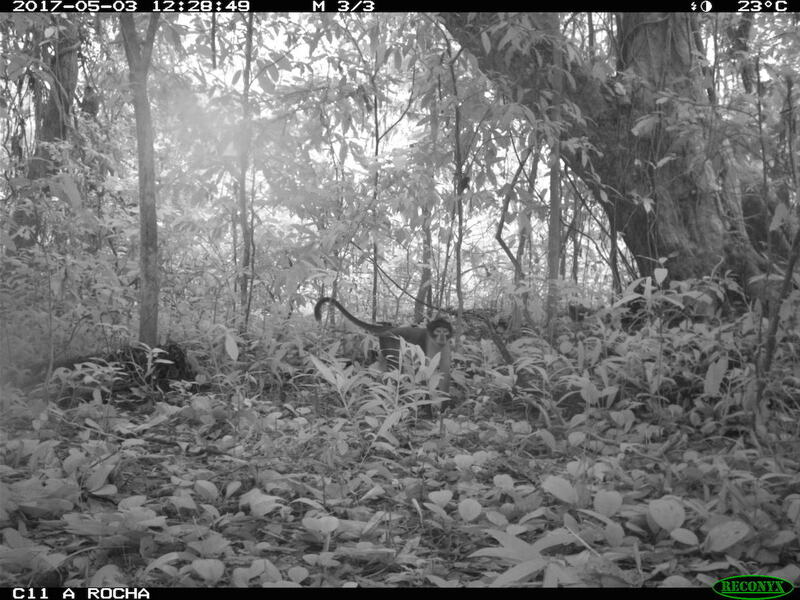 These may be the first photographs of this rare type of mangabey in the wild according to a researcher. The exciting discovery is tempered by the sober reality of what lies beneath the monkeys' feet. Bauxite, the ore from which aluminum is produced, is found in large deposits in the Atewa mountains. Ghana has around 960 million metric tons of bauxite deposits that, if refined, would be worth an estimated $460 billion. In 2017 Ghana reportedly signed a memorandum of understanding with China to develop the bauxite deposits. Mining the ore, usually done at the surface, will undoubtedly wipe out the forest and the mangabeys who live there. Much of the range is designated a forest reserve, but that category may not be enough to protect the forest from mining. Activists are urging the government to designate the region a national park. The forest is also critically important as a watershed for the human population of the city of Accra.